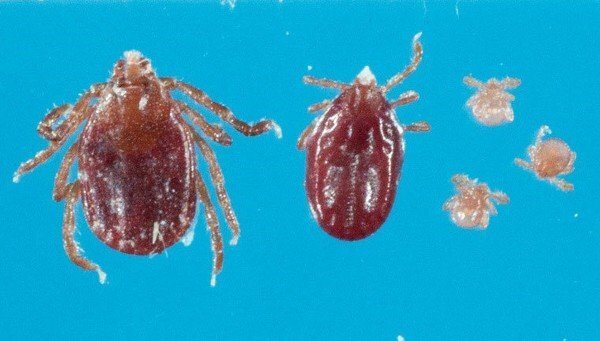 A swarming, exotic tick species is now living year round in N.J.
An exotic species of tick that mysteriously appeared in New Jersey last year is now here to stay. The New Jersey Department of Agriculture announced Friday that the East Asian tick, also known as Longhorned tick or the bush tick, which was discovered on a Hunterdon County farm last year, has survived the winter. “Ongoing surveillance continued during the winter and on April 17, 2018, the National Veterinary Services Laboratory confirmed the Longhorned tick successfully overwintered in New Jersey and has possibly become established in the state,” it was stated in a news release. Last summer, a farmer walked into the Hunterdon County health office covered in thousands of the ticks after she was shearing a 12-year-old Icelandic sheep named Hannah. Experts were called in to identify the tick which was not previously known to exist in the United States. The Department of Agriculture says it still does not know how the tick made its way to New Jersey. The sheep has never traveled internationally and has rarely left Hunterdon County, according to Andrea Egizi, a tick specialist at the Monmouth County Tick-borne Disease Lab. When the incident was first reported, steps were taken to eradicate the insect from the farm by using a chemical wash on the sheep and removing tall grass where the they are known to dwell. The exact location of the farm and the identity of the sheep farmer is being withheld by the New Jersey Department of Agriculture. Although the ticks are known to carry diseases, such as spotted fever rickettsioses in other parts of the world, tests performed on the ticks and the farm animals were negative for diseases. Local, state and federal animal health and wildlife officials, as well as Rutgers University – Center for Vector Biology, are working together to eliminate the ticks and stop them from spreading. Wildlife and livestock in the area will continue to be monitored throughout the year. The ticks are known to swarm and infest deer and animals other than sheep, so the department is warning that it has the potential to infect other North American wildlife species. The ticks reproduce asexually by cloning themselves and just one of them is capable of laying thousands of eggs. State and federal Department of Agriculture employees will be working with the public to determine if the tick has spread and to educate the public about protecting their livestock and pets from the pest. The nymphs of the ticks are very small, resemble small spiders and are easy to miss, according to the Department of Agriculture. They are dark brown, about the size of a pea when full grown and can be found in tall grasses. Authorities are asking people to contact the state veterinarian at 609-671-6400 if they see any unusual ticks on their livestock. Unusual ticks detected in wildlife should be reported to the New Jersey Division of Fish and Wildlife, Bureau or Wildlife Management at 908-637-4173, ext. 120. Any questions about tick-borne illness in humans should be directed to local health departments or the New Jersey Department of Health at 609-826-5964. Author Garden State Sheep BreedersPosted on April 27, 2018 Categories Animal Husbandry, Government, Topics, VeterinaryLeave a comment on A swarming, exotic tick species is now living year round in N.J.
What if, before you purchased a hat or sweater, you knew the wool used to make it came from sheep raised on a ranch managed to improve soil health and increase soil carbon? For nearly a decade, ranch owner Lani Estill has worked with the USDA Natural Resources Conservation Service to improve soil health. By adding carbon-conscious conservation practices to her ranch, the operation now stores more carbon in the soil than it emits through its operations. As a result, her operation, Bare Ranch, is marketing “climate beneficial” wool to a national clothing manufacturer. Estill and her family raise sheep and cattle on her 40,000-acre ranch, which sits on the border of northern California and northwest Nevada. With help from her local NRCS offices and supported by Environmental Quality Incentives Program contracts, Estill has also improved wildlife habitat on her ranch. She improved sage grouse habitat by removing thousands of acres of invasive juniper and installed hedgerows for pollinators. She and her co-owners also installed fencing and livestock watering facilities and are following a prescribed grazing management plan. Read the full story at www.usda.gov/blog. To support animal disease traceability and scrapie eradication efforts, the United States Department of Agriculture’s Animal and Plant Health Inspection Service has provided both metal and plastic ear tags and applicators to sheep and goat producers – at no cost – since fiscal year 2002. After a funding reduction in FY 2012, APHIS used specific, no-year funding (for scrapie and ADT) to continue purchasing the tags and distributing them free of cost to producers. These no-year funds were exhausted in fiscal year 2017. While the Agency remains committed to ADT efforts, beginning Oct. 1 of this year, APHIS is providing only metal tags free of charge to producers and others who handle sheep and goats. Plastic tags and applicators for metal and plastic tags will remain available for purchase directly from approved tag manufactures. These changes will reduce APHIS tag and applicator costs while still providing sheep and goat producers with a free identification device. APHIS will provide a limited number of plastic tags to producers newly enrolled in the Scrapie Free Flock Certification Program who submit tissues for scrapie surveillance in order to encourage on-farm scrapie surveillance. The agency will continue to work closely in partnership with states and industry to achieve scrapie eradication. For more information on how to purchase tags and applicators, visit https://www.aphis.usda.gov/animalhealth/scrapie-tags. Note: The American Sheep Industry Association and other stakeholder groups continue to work with USDA on alternatives to this new policy, including increasing the appropriations designated to the scrapie eradication program. ALLENTOWN, Pa. — Farmers who have been selling direct to consumers via farmers markets and/or CSAs (Community Supported Agriculture) have noticed a shift in those market channels. For the last few years, farmers markets and CSAs have been stagnant and in some cases shrinking. Are there other market channel opportunities for farmers? Are there techniques we can use to improve customer retention? What are the current trends in local food we can capitalize on? Penn State Extension along with Buy Fresh, Buy Local Greater Lehigh Valley will host an “Intensive Marketing” program at the Nurture Nature Center, 518 Northampton Street, Easton, Pa., on Dec. 8. Nick Burton, State of The Soil, Simon Huntley, Small Farm Central and Marilyn Anthony from Temple University Fox School of Business will help to improve and sharpen our marketing skills for this day-long workshop. Registration and detailed information to follow soon. For more information contact Brian Moyer at 610-391-9840 or email at bfm3@psu.edu. BURLINGTON, Vt. — The call for applications for 2018 Farmer Grants has been released by the Northeast Sustainable Agriculture Research and Education (SARE) Program. Proposals are due online by Tuesday, December 5, 2017 at 11:59 p.m. ET. Funded projects will be announced in March 2018 and projects may begin in the spring. Northeast SARE Farmer Grants are intended for farm business owners and managers who would like to explore new sustainable production and marketing practices—often through an experiment, trial or on-farm demonstration. Reviewers look for innovation, potential for improved sustainability, and results that will be useful to other farmers. Awards are capped at $15,000 and projects may address the wide range of issues that affect farming in the Northeast. To search topics that SARE has previously funded, please access the national database of projects at: https://projects.sare.org/search-projects/. Applicants must work with a technical advisor—typically a Cooperative Extension educator, NRCS staff, university research or extension specialist, private crop consultant, veterinarian, or other service provider—who serve the farmer applicant in a consulting capacity. Application materials, including detailed instructions and supporting documents, are posted on the Northeast SARE website at http://www.northeastsare.org. Questions about the grants program should be directed to northeastsare@uvm.edu. The Northeast SARE region is made up of Connecticut, Delaware, Massachusetts, Maryland, Maine, New Hampshire, New Jersey, New York, Pennsylvania, Rhode Island, Vermont, West Virginia, and Washington, D.C. Northeast SARE programs are offered to all without regard to race, color, national origin, gender, religion, age, disability, political beliefs, sexual orientation, and marital or familial status. TRENTON, N.J. — New Jersey Secretary of Agriculture Douglas H. Fisher has announced $10,000 in competitive mini grants is available to schools or school districts for the purpose of developing Farm to School activities in New Jersey schools. The grant money can be used for the purchase of materials to support school gardens that grow fruits or vegetables, the cost to transport and pay for class trips to New Jersey farms, or the purchase of cafeteria salad bars that will increase the offering of fresh fruits and vegetables in school meals. Funds have been made available through legislation signed into law in 2014, which allows contributions to the New Jersey Farm to School Program through the Farm to School and School Garden Fund tax check-off. Additional legislation signed in 2014 created the Farm to School Donor Fund, making it possible for private donations to supplement Farm to School activities in the state. Mini grant applications will be open until Dec. 15. Farm to School Programs also include school garden activities that teach students where food comes from by growing it themselves. Students benefit by learning the science behind farming and the nutritional value of fresh produce to gain a greater understanding and appreciation of the environment and supporting local farmers. Educators can use school garden programs to teach any subject — math, science, language arts, health and nutrition, art or social studies. In New Jersey, Farm to School Programs promote and create a sense of community for all involved. WASHINGTON — The House Agriculture Committee has held a hearing to examine how the tax code impacts agricultural producers. Members of the committee heard from a panel of Members of Congress—including Rep. Kristi Noem (SD-at large) and Rep. Lynn Jenkins (KS-2)—from the House Committee on Ways and Means, the committee charged with crafting our nation’s tax code. The Committee also heard from a diverse panel of witnesses including agricultural and tax professionals. “Both the ranking member and I are CPAs, and many of our colleagues in Congress are small business owners in their own right,” said Agriculture Committee Chairman K. Michael Conaway. “Few business sectors in America are subject to as many unknowns as farming and ranching. With the upcoming potential for tax reform, it is important to highlight the unique challenges of the agricultural industry and explore opportunities within the tax code to better support a vibrant farm sector. Written testimony provided by the witnesses from today’s hearing is linked below. Click here for more information, including Chairman Conaway’s opening statement and the archived webcast. TRENTON, N.J. — The New Jersey Department of Agriculture has quarantined properties in Hunterdon and Somerset counties after a horse developed highly infectious equine herpes myeloencephalopathy. EHM is the often deadly neurologic form of the Equine Herpes Virus infection. No recent movement had occurred at the farm where the virus was reported prior to this case. The horse was moved into the isolation barn at a local animal hospital the evening EHM was confirmed. Both the horses at the original farm and the hospital are under quarantine. The EHV-1 organism spreads quickly from horse to horse and can cause respiratory problems, especially in young horses, spontaneous abortions in pregnant mares, and the neurologic form of the virus can result in death. The incubation period of EHV-1 is typically 2-10 days. Clinical signs include respiratory disease, fever, nasal discharge, depression, cough, lack of appetite and/or enlarged lymph nodes. In horses infected with the neurologic strain of EHV-1, clinical signs typically include mild incoordination, hind end weakness/paralysis, loss of bladder and tail function and loss of sensation to the skin in the hind end. The virus spreads readily through direct contact with infected materials. While highly infectious, the virus does not persist in the environment for an extended period of time and is neutralized by hand soap, alcohol-based hand sanitizers and sunlight. The virus does not affect humans and other domestic animals, with the exception of llamas and alpacas. Concerned owners should consult with their veterinarian prior to taking any action as the clinical signs of infection with the neurological form of EHV-1 are common to many other diseases. EHM is a reportable disease in New Jersey. If an owner has a horse exhibiting neurologic signs or suspects Equine Herpes, they are directed to call their veterinarian immediately.